When buying furniture sets for your baby nursery there are many factors to consider. Is baby safety one of them? How much though do you invest in the baby or children’s safety when buying a furniture for their room. In this post we will cover safety issues concerning cheap baby furniture sets like changing tables, baby cribs and gliders and ottomans. An accident at home can happen to anyone, but when using safe baby furniture parents can reduce the chance for many accidents and keep their loved ones safe. Here are some examples how cheap baby furniture which may have all the right certificates are still less safe than other furniture sets which usually cost a little more. One of the best selling items is a cheap glider made out of wood. These wooden gliders have all the moving parts uncovered at the bottom of the glider. The most obvious accident is when small babies or toddlers crawl and inset their hands between the wooden bars. One slight movement and the delicate hands or fingers get squashed. 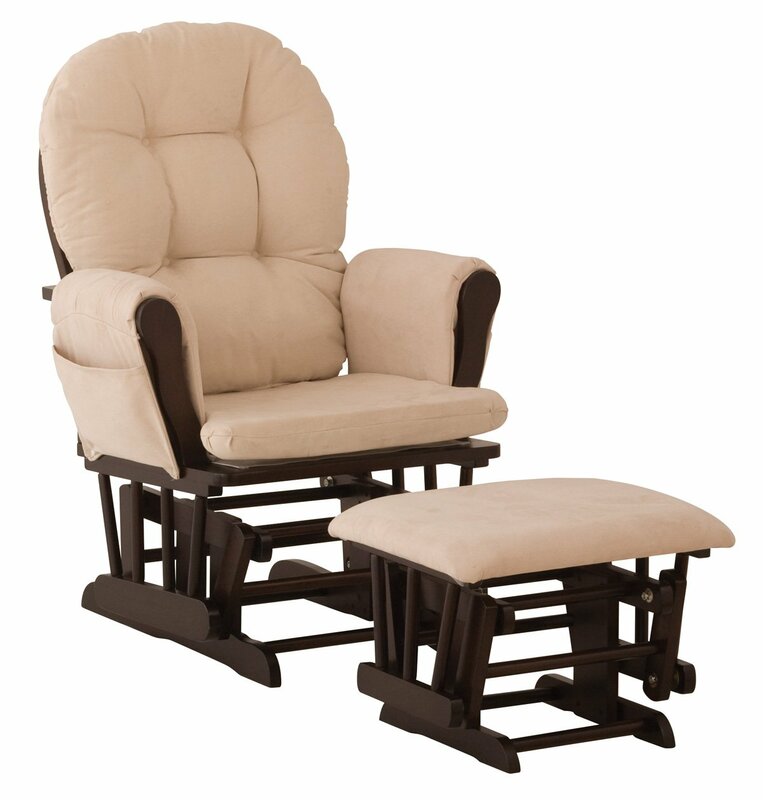 Upholstered gliders may cost more, but all their moving parts and joints are covered by a long ‘skirt’. There are several changing tables which have all the certificates needed. But they have only 2 railings or even no railings at all. Other cheap changing tables do not have a sturdy base, or they have lower drawers which can be climbed on by older brothers. Some changing tables do not have a changing mattress fixed to the top of the furniture, so the mattress can slide off the table with the baby strapped on it. More sturdy changing tables, have less chances to flip over, they have 3-4 railings surrounding the changing table rim. This helps to prevent the baby roll off and to keep the mattress in place. Here are some furniture we belive have better features than others. We think the safety of these items is found by the added thought we noticed the manufacturer invested, when designing them. Finish:Pure White The country-style Savannah Changing Table features slatted drawer fronts with an exterior trim, designed for baby’s safety. Top of the changing table features rounded contours for added safety. Three open storage compartments provide easy access. Wooden knobs. Secure smart glide drawer slides Meets or exceeds all US Consumer Product Safety Commission Standards and conforms to ASTM standards as well. This entry was posted in Baby Monitors, Baby Safety At Home, Gliders & Ottomans, Stokke Strollers, Strollers & Joggers, White Baby Bed Cribs, White Baby Cribs $100-$200, White Changing Tables and tagged baby crib safety, Baby Joggers Safety, Baby safety on Glider, safe changing table, Safety Tips For Rocking With Baby on Glider with Ottoman by dekel. Bookmark the permalink. Next → Next post: Are Your Kids Safe With ‘Buffy’ The Babysitter? ?